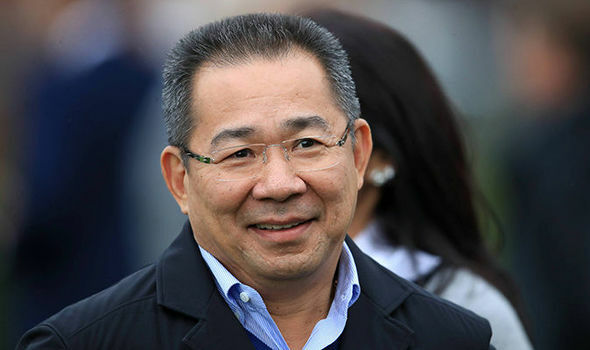 A helicopter believed to be carrying Vichai Srivaddhanaprabha, Leicester City’s chairman, crashed outside the King Power Stadium following the club’s match on Saturday night. The BBC reported that Srivaddhanaprabha was on the flight, citing a source close to the family. It was unknown how many people were aboard the helicopter or whether there were any survivors. The incident occurred around an hour after the final whistle. The Thai owner’s helicopter crashed near a car park near the south-east corner of the stadium shortly after taking off from the pitch at around 8.30pm. Wreaths and flowers were being laid at the King Power Stadium on Sunday morning after the crash as people gathered to pay their respects. A large image of the Hindu god Ganesh had also been propped amongst the flowers. Eyewitness reports indicated that the helicopter only just cleared the roof of the stands, stayed in the air briefly and spiraled down to earth after reportedly developing a fault with its tail rotor. A huge fireball erupted and the air smelt of burning fuel in the hours after the crash. Emergency services rushed to the scene to tackle the fire and search the wreckage, with the area eventually cordoned off by Leicestershire police. It is understood that the helicopter fell outside a fence surrounding the stadium perimeter. However it crashed on land owned by the club, landing near car park E, which is used by Leicester’s staff. It is unclear whether the helicopter landed on any objects or if any bystanders were injured by the crash. The areas around the stadium had largely emptied after the game. West Ham’s squad were already on their way back to London at the time. There was confusion outside as security personnel attempted to restore order and prevent members of the public from taking pictures and filming videos of the wreckage. Supporters in the area walked away in obvious distress and Kasper Schmeichel, Leicester’s goalkeeper, was seen in tears outside the ground. Srivaddhanaprabha, 60, has four children. It is unclear if any of Srivaddhanaprabha’s family members were on board. Aiyawatt Srivaddhanaprabha, Leicester’s vice-chairman and Srivaddhanaprabha’s son, was not at the game. Leicestershire police said in the early hours of Sunday that the air accident investigation branch (AAIB) was leading the investigation into the circumstances of the crash. The force said: “A cordon is currently in place at the scene to enable the AAIB to examine the area and complete their initial enquiries. A spokesperson for King Power, Vichai’s company in Thailand, declined to comment on Sunday morning. After unsubstantiated rumours that Leicester manager Claude Puel was aboard the helicopter, the French newspaper Nice Matin reported that Gregory Campi, a close friend and coach at AS Monaco, had confirmed that he was safe. “I spoke to him last night. Claude and his wife are fine,” Campi said. Leicester are scheduled to host Southampton in the Carabao Cup on Tuesday. However there is doubt over whether the game will go ahead. Srivaddhanaprabha, who bought the east Midlands club for £39m in 2010, is normally flown back to London in his private helicopter after home games. He has become a hugely popular figure at Leicester, who have become a regular presence in the top half of the Premier League under his ownership. The Thai businessman helped Leicester return to the top flight of English football in 2014 and he became part of the club’s folklore when his backing helped Leicester win their first ever Premier League title in 2016. Srivaddhanaprabha, began his business journey by opening a duty free shop in Bangkok in 1989. His retail company, King Power, grew to prominence in Thailand and he is ranked as the fifth richest person in the country, with an empire worth £3.8bn. He extended his influence in European football when he bought Belgian club OH Leuven in May 2017. The club reside in the Belgian second division. Dear paedophiles, please leave our children alone!